When you doubt that time is flying by too fast. This will snap it into focus for you. I am not quite sure how this happened when we weren't looking. She is so much fun now but I already miss those sweet newborn toes gone by. Oh yes, I do understand. They grow so fast. You have to enjoy them while you can! 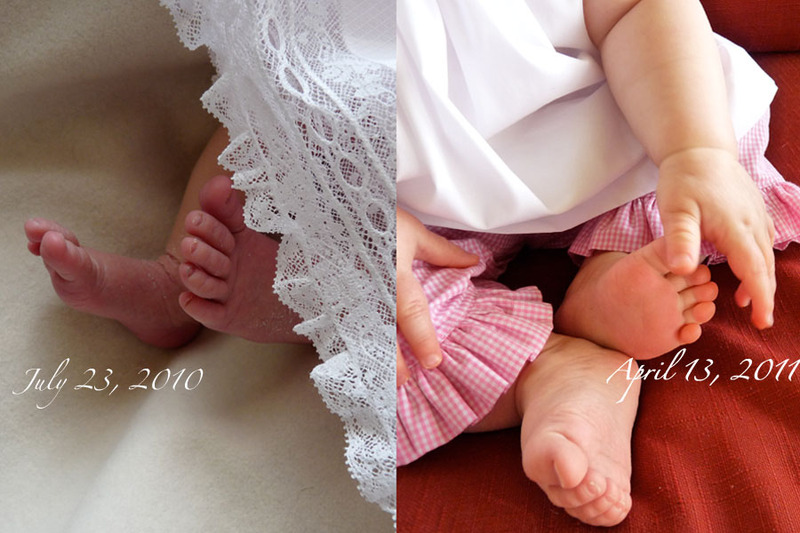 First thing I checked when my babies were born... their precious little toes! Now they're grown and I am waiting on grandbabies... time marches on! I am with Angela.....16 years ago today, I was snuggling my miracle baby....all 9.9 lbs of him...counting his ten sweet toes.....today, his big size 14 feet with the long ugly hairy toes are not nearly so sweet. Enjoy that baby girl as I know you truly are! One more thing to watch out for ... is when that little crease in her arm actually becomes a wrist... that to me signifies they are no longer babies. Until then, they are... once that is gone they are truly toddlers and life is changed.